When all is said and done at the end of Batman Eternal Vol. 3, this has been a superlative weekly series for DC Comics. It's also an impressive achievement for Scott Snyder and company to have, in addition to ten volumes of acclaimed Batman work, also a fifty-two issue, three volume collection set that ties into the run but also stands well on its own. It's enough to make one wonder if single-character weekly series are the way to go, forgoing these large-scale weeklies like 52 and Futures End for something more focused and intimate, insofar as Batman Eternal can be considered such. Best among the third volume of Batman Eternal is how the writers ramp up sticking the book's mystery to the readers. Most people probably had the culprit in their top three guesses, but there's a great air of a whodunit being worked out. And the book's penultimate red herring is fantastic; even if I knew "who," I never saw the "how" coming. This volume also offers significant spotlight on the younger members of the Bat-family -- Red Robin, Harper Row, and Spoiler Stephanie Brown -- each of whom come off charmingly, such to make me eager for James Tynion's forthcoming "young Gotham"-centric "Rebirth" Detective Comics. Also, unusual for a weekly book, the art here is almost uniformly excellent throughout. 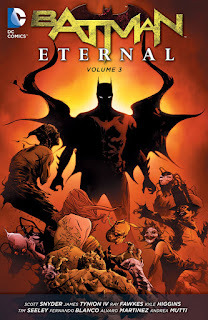 Like all weekly series, Batman Eternal meandered a bit, and like all weekly series some of its storylines finished stronger than others, but in all this was well done. Probably there's no way to prevent readers from guessing Lincoln March was behind all of this from the start. Specifically that the book makes the choice never to raise March as a suspect probably telegraphed it, though I'm not sure mentioning March would have been any wiser. But I nearly believe that was Eternal's intention, as having the villain in the first issue's flash-forward say "Bruce" was another strong indicator -- and the bad guy speaking the dialogue turned out instead to be Cluemaster. Arguably Cluemaster's role is the series's big mystery (and with two antagonists, its most Hush-esque aspect), though the organization of the reveals is slightly muddled (except that March, appearing last, gives the book a rock 'em, sock 'em finale). Rather like the Riddler and Hush, Eternal is the story that proves Cluemaster Arthur Brown as a viable villain, even as it'd be tough to go to that well again and also of course it doesn't seem Brown makes it out alive. Ultimately the Cluemaster's plan hinges on the idea that Batman (and the reader) would be so busy searching his A-list rogues for the key to all the chaos in Gotham that he wouldn't consider D-list villains like Cluemaster. That's valid; the writers basically present Cluemaster as the culprit from the beginning, and I at least looked right past it. At the same time the writers wobble it a bit, because no one considers Cluemaster for his role, but then it turns out Cluemaster isn't the final villain and whom everyone actually thought it was is. In the midst of a big Bat-event, there's a mild send-up here of Bat-events, that so many involve chaos in the streets and a mastermind (even the natural disaster Bat-events have masterminds) that the reader is accustomed to looking high for the culprit and plan; in this case, the culprit was low and the plan was almost no plan at all. Eternal's re-introduction of Brown's daughter Stephanie as her original, father-foiling, bratty Spoiler incarnation seems on the surface a regression for the once-Batgirl character. At the same time, there's a strong indication in this book of Cluemaster as a criminal genius, and that perhaps Stephanie shares his inherent intellect. That itself would be a nice change for the previously wannabe-superhero Spoiler that she might bring preternatural brains to the game this time, even to match perennial boyfriend Red Robin Tim Drake (the scene where the two meet again for the first time is gold by Tynion). At the same time Tynion will have work to do in Detective to explain many things about Stephanie, from where her costume came from to how, variably throughout Eternal, a regular high school student can also be a renown blogger who somehow breaks exclusive celebrity gossip news. But Eternal Vol. 3's breakout star is Harper Row, now Bluebird, who finally gets her costume this issue. I appreciate that the writers didn't make this entire title an episode of Young Heroes in Love and that Bluebird and Red Robin emerge as pseudo-siblings and not in a romantic triangle. The Tim Drake character's depiction has slowly devolved over a couple of writers (and perhaps Teen Titans Go isn't helping either) to the point where he's routinely obsessive, neurotic, and unlikable in the New 52, but Harper's friendship helps humanize him quite a bit. Equally Harper and Stephanie are fun, reminiscent of sorts of Stephanie and also-former-Batgirl Cassandra Cain; it's not apparent where we find Harper in the "Rebirth" DC Universe, but I'd think she'd naturally fit in Tynion's Detective as well. Flipping back through this volume, it drags only a little when the Arkham villains first gather; they're played for comedy here, whereas I prefer Batman's foes more fearsome as in the book's final issues. Taken as a whole, I initially disliked Eternal's episodic structure where Carmine Falcone was the villain until he wasn't, and then Hush was the villain until he wasn't, but I can't see much wasted now -- Falcone led to Jason Bard being commissioner and Hush continued to play a role into the third volume. Even Ray Fawkes's Deacon Blackfire storyline, which gets laborious here and peters out in Batwing being haunted by ghosts at home, brought about the significant destruction of Arkham Asylum in the second book. Again, it's tough to remember a weekly series where the art is so consistently good. Eternal Vol. 3's MVP is Fernando Blanco, who draws the volume's beginning and end in a style both gritty and roundly animated; I have not always liked Marcelo Maiolo's monochrome color schemes on Green Lantern Corps, but here it works especially well as combined with some digital shading. Andrea Mutti, who recently drew the Vertigo adaptations of Steig Larsson's "Millennium Trilogy," brings a true crime vibe to some crime boss Catwoman issues. Felix Ruiz adds sketchy mystery to the Riddler issue (and a hint of Batman's costume a la Injustice). Joe Quinones is right-on cartoony for Harper's transitional issue, and David LaFuente also brings anime influences for some of the "young Gotham" scenes. It's also always good to see Constantine's Aco's dynamic page layouts (and with Fawkes again). Batman Eternal Vol. 3 ends a smart sprint through the Batman mythos that in this volume alone includes such deep dives as Professor Milo and Dr. Darrk, not to mention a modern nod in the Talon cameo; I additionally appreciated that Eternal managed to pivot Jason Bard from unexpected villain to his more traditional private detective status. The weekly format has been just right for this book, allowing it to accomplish a whole lot and requiring only a year to do it. I'm excited to start the Batman and Robin Eternal that follows this (after "Superheavy" and whatnot), but as I said, I'd consider a Superman Eternal or Wonder Woman Eternal too, though maybe the new twice-monthly "Rebirth" format will accomplish the same. Considering Batman and Robin Eternal is getting better buzz than this, I can't wait to see just how much it will surprise me. I thought this was rather mediocre, honestly. It suffers from a bad case of a story dragging its heels to buy time because it didn't have enough story to last 52 issues. The presence of the Owls and Lincoln March really added nothing to the story, and some of the subplots read like fanfiction. To each their own, of course. What necessarily seemed like or would you qualify as fan fiction? I thought the Jason and Barbara subplot was really cringe-inducing to read, mainly when they got back to Gotham. Like they had no purpose in the story other than to have a CW-esque drama subplot. And the Arkham subplot was bad as well, like a half-hearted excuse for Batwing and Corrigan to hang out, only for the writers to completely forget what their endgame was. I didn't like how the Corrigan/Batwing story petered out, and it seemed especially to lack direction after Arkham was destroyed, when Luke's being haunted by random ghosts. I thought the first collection of Gotham by Midnight was great, though, and Fawkes said he was intending to bring Batwing in later, though I don't think that ever actually happened. Does this Volume stand alone, or do I need to catch up with the first 2 to get the most out of it? Each volume has a relatively distinct ending, but there's a lot of who characters are and how they got where they did that you won't know without the first two books. Why start with Vol. 3 of a miniseries necessarily? Fair enough. No real reason to start with vol. 3, I tend to dip in and out of story lines I like rather than reading a whole arc. I rarely read weeklies and have a decent grasp of the bat-universe characters, so don't feel a great need to find out what the latest version of canonised character is. In that case, Vol. 3 is good, but Vol. 2 is better just by a hair. Depends -- Vol. 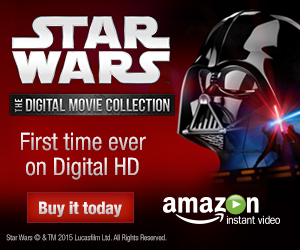 2 is something of a widescreen disaster story, Vol. 3 is more supervillain-focused. Again by a hair, Vol. 1 is least good, though it seems in many ways Gotham (TV) inspired or an attempt to bring some Gotham to the comics.